13 posts are filed under this symbol. Intel on AMD’s Barcelona: "Too Little Too Late"
May 22, 2007 4 Comments AMD, INTC. Pat Gelsinger, Senior VP/GM of Intel’s (INTC) Digital Enterprise group (i.e. CPUs), keynoted the JPMorgan Technology Investment conference yesterday, and as ususal, the really interesting bits were in the Q&A. April 4, 2007 Post a comment AMD, CMCSA, MSFT, T, TIVO, TWC. Anandtech has an absolutely horrifying review detailing the trials and tribulations of setting up a Windows Vista home theater PC (HTPC) with the first HD capable TV tuner from ATI (AMD). Even with the on-site assistance of Dell (DELL) and Time Warner Cable (TWC) (with promptness and technical expertise you or I could never hope to see) it took two days to get the Windows Vista PC, external HDTV cable tuner, and Time Warner Network integrated and up and running. The resulting experience was great, though most consumers would have never had the patience or technical fortitude to get it up and running. It makes one wonder why anyone would bother to do this at all. January 22, 2007 2 Comments AAPL, AMD, INTC, JAVA. Intel (INTC) has nearly completed a complete clawback of server market supremacy with today’s announcement that Sun Microsystems (SUNW) will closely collaborate with Intel. After substantially improving their devices and surpassing the benchmarks set by AMD (AMD), Intel is back in the drivers seat when it comes to high margin server CPUs. This was an outcome I felt was never in doubt. July 24, 2006 Post a comment AMD, ATYT, INTC, NVDA. What was rampant speculation (including ours) is now official– AMD (AMD) is buying ATI Technologies (ATYT), a Canadian maker of graphics accelerator chipsets. Graphics acceleration is no longer for gaming freaks; the new version of Microsoft Vista contains advanced visual features dubbed “Aero” that demand more functionality than the standard video frame buffer can provide. July 14, 2006 Post a comment AMD, ATYT, INTC. The pre-release benchmarks and rumors about Intel’s (INTC) new architecture are holding firm now that the silicon has seen official release. Two independent reviewers have written opinions about the new Intel Core processors (see below)… both were previously solid AMD (AMD) supporters. Intel has now seized a commanding lead in performance desktop processors. This is in addition to the spectacular technical success of Woodcrest in Server space – where AMD has caused the most financial damage. June 8, 2006 2 Comments AMD, INTC, JAVA. Perhaps investors will pause for a moment from their ritualistic dead-horse-beating about the demise of Intel (INTC) and the ascendency of AMD (AMD). They should read a recent performance benchmarking from AnandTech, “Intel Woodcrest, AMD’s Opteron and Sun’s UltraSparc T1: Server CPU Shoot-out“. It’s a great overview of the performance of Intel’s new Woodcrest Server chip, and how the Core architecture is improving the performance of their chips across the board. In my discussion of the New Four Horsemen, I also linked to an article comparing the Intel Core versus AMD’s K8 architecture. Intel is not without troubles. But the idea that AMD is going to continue to take large share gains is absurd. AMD clearly took advantage of the horrific Xeon performance in the server space. Much of the Intel share loss and most of the profit hit was from losing this high margin business. Read the Anandtech articles and it’s clear to me that the days of easy share gain for AMD are over. Add to the fact that one analyst is seeing the signatures of a nasty price-war developing and I think we are seeing what Andy Grove likes to call an inflection point. Now they just need to fix their awful marketing. The real loser here? Sun Microsystems (SUNW) and their build-their-own CPU strategy pulled from the playbook of virtually every computer company that went out of business in the last 20 years, something we pointed out six months ago. In the semiconductor business, the clock re-starts every two years. You put yourself out of business or the other guy will. There is no permanant advantage. And the clock just restarted. Game on boys. May 18, 2006 2 Comments AMD, INTC. 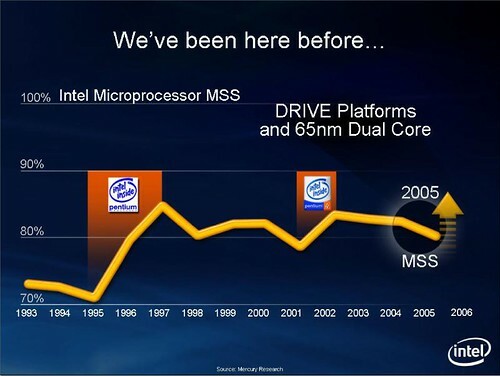 I reviewed the slides presented by Paul Otellini at the Intel (INTC) 2006 Annual Meeting. 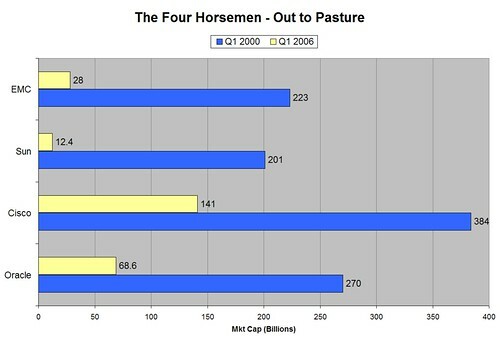 The most interesting one puts the recent market share decline in perspective. What surprised me was the big leap back in ’95, when the Pentium branding pulled the rug out from under AMD (AMD) and Cyrix who had ‘cloned’ the i486 nomenclature. That was a masterful marketing move, second only to the best one in semiconductor history, Intel Inside. May 15, 2006 14 Comments AAPL, AMD, CSCO, DELL, EMC, GOOG, HPQ, INTC, JAVA, MSFT, ORCL, YHOO. Your broker neglected to mention that the biblical Four Horsemen of the Apocalypse were steered by four riders – Conqueror, War, Famine and Death. I’ll leave it to my readers to pair them appropriately.